Joules, purveyors of eccentric British country fashion, recently announced their Autumn collection featuring plenty of animal and bird motifs, including the flying duck cardie and top illustrated above - a cheeky nod to British fifties style which I love. As well as beautiful soft knitwear, they have a whole array of animal prints on blouses and dresses - I've got my eye on a foxy jumper (£69.95) plus warm women's coats, and a lovely chunky cable knitted cardigan (£129). And I'm rather partial to the muck boots (£79.95) - perfect for the impending cold weather... (I do not intend to do any mucking out, mind you). 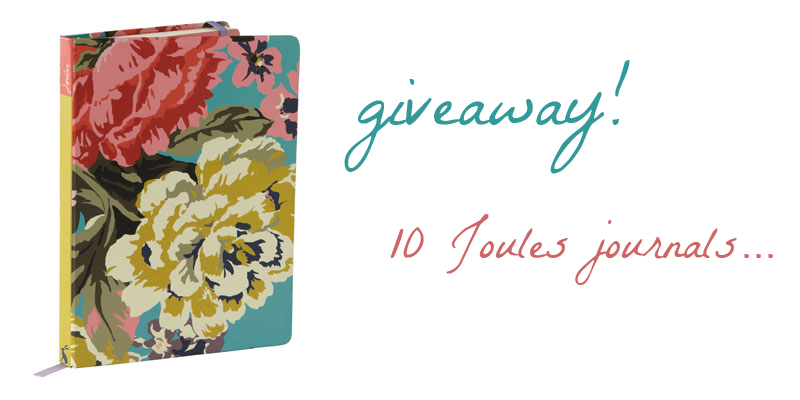 The lovely people at Joules have given me £100 worth of prizes to give away - 10 floral A5 journals worth £10 each for ten lucky winners.